As Empire Communities marks its 25th anniversary, the company’s most ambitious high-rise condominium development, Eau Du Soleil in Toronto, is nearing completion. The excavation on the nearly three-acre site at Humber Bay was equivalent to the size of 90 Olympic-sized swimming pools, according to Empire high-rise president Emilio Tesolin. He also noted the 80,000 cubic metres of concrete poured so far would stretch around the earth if it was contained in three-inch cubes. Eau Du Soleil was designed by Richmond Architects Ltd. and Zeidler Partnership Architects. Construction started in March 2015. 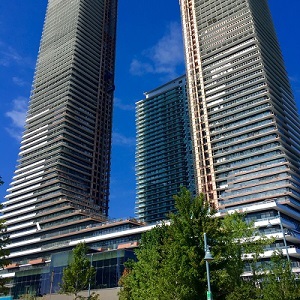 A phased occupancy is slated to begin in February for the 195 units in the podium, which connects the 50-storey Water tower with the 67-storey Sky tower at 2183 Lake Shore Blvd. W.
All of the suites, with interiors designed by Studio Munge and Flora Di Menna Designs, should be ready for move-in by February 2020. More than 350 people are working on Eau Du Soleil every day, and RENX was recently invited to the 60th floor of Sky to see the progress and stunning views it will offer. Prices were in the $700-per-square foot range when sales began in 2012. Now, with 1,269 of the 1,280 units in Eau Du Soleil sold, they’re more than $1,000 per square foot — making the condos the most expensive on Humber Bay, according to Empire executive vice-president of sales Dan Flomen. Eau Du Soleil’s unit sizes start at 400 square feet and extend to 2,000 square feet. There are a variety of bedroom configurations, ranging from one-bedroom-plus-den to three-bedroom units. One “super penthouse,” which hasn’t yet been marketed, will be 3,500 square feet and priced around $4 million, according to Flomen. Eau Du Soleil will feature more than 40,000 square feet of indoor and outdoor amenity spaces, including a fitness centre, a 24-hour concierge, an indoor saltwater pool and hot tub, a terrace with outdoor barbecues, a party room and a theatre room. There will be 1,323 parking spaces for owners and 226 for visitors. Electric vehicle charging stations will be included. There will be 55,000 square feet of commercial and retail space in Eau Du Soleil. Although no names have been disclosed, two restaurants, two real estate offices and a convenience store have been confirmed as tenants. Eau Du Soleil is on the Lakeshore streetcar line, there’s a nearby direct bus route to the Bloor-Danforth subway line, and the Mimico GO train station isn’t far away. It’s a short drive from the Gardiner Expressway, Queen Elizabeth Way and Highway 427. * Empire Rain & Senses is a 532-suite condo community in the Kerr Village neighbourhood in Oakville. Rain is complete and occupancy preparation for Senses is underway.